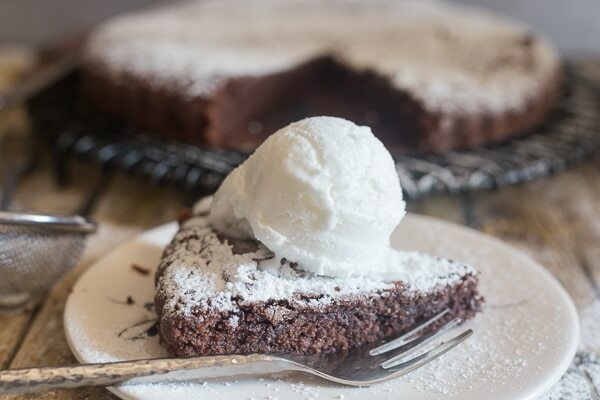 Tenerina or maybe better explained as an Italian Brownie Cake is deliciously rich and chocolatey , perfect with a dusting of powdered sugar or with a scoop of vanilla ice cream. So good. 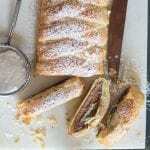 I was asked a couple of weeks ago to a share a recipe from my up coming Cook Book Authentic Italian Desserts and to tell the truth I made 4 different recipes (including this one) before deciding. I hope you find the recipes in the book as tempting and hard to decide as I did. Not because I didn’t think the others were up to sharing, (au contraire), but I needed to share something that maybe said something about me and maybe even some place in Italy that I loved. 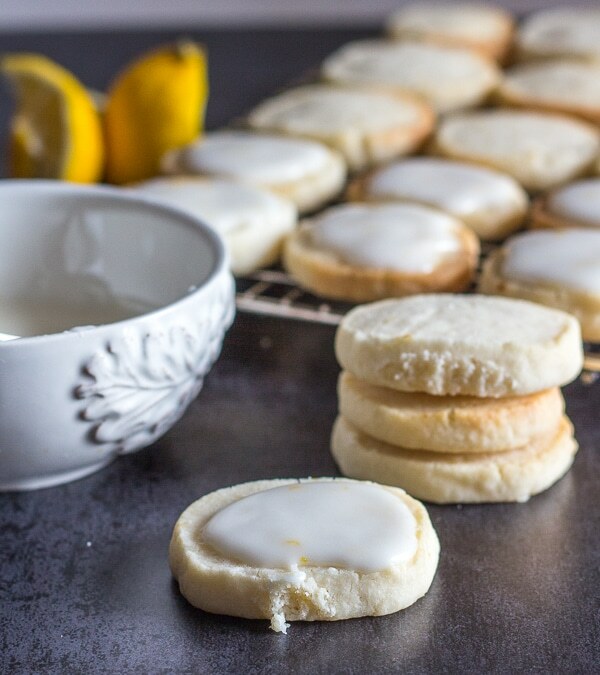 and onto one of our favourite over the top Lemon Cookies with the perfect lemon glaze. I finally decided that something chocolatey was the one! What made me decide on the Tenerina or Brownie Cake if you will? Well a few things, I am definitely a chocolate lover and this wonderful cake has real melted chocolate not cocoa! And I absolutely love the Northern part of Italy, which is where this cake originated. And that little bit of crunchy topping with the “cuore morbido” (soft heart in the middle) and of course a dusting of powdered sugar, because really what Italian dessert doesn’t have a sprinkling of powdered sugar? 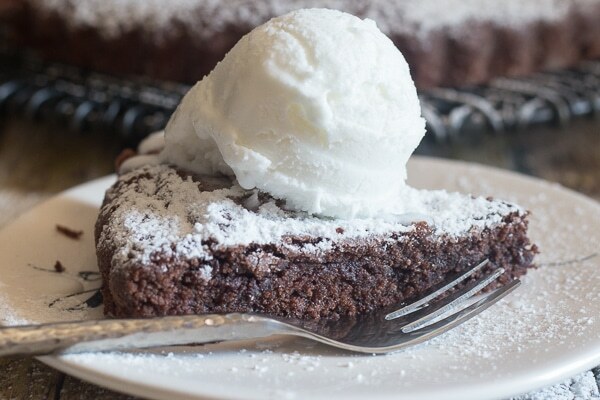 Makes this Brownie Cake one of my definite chocolate must haves. 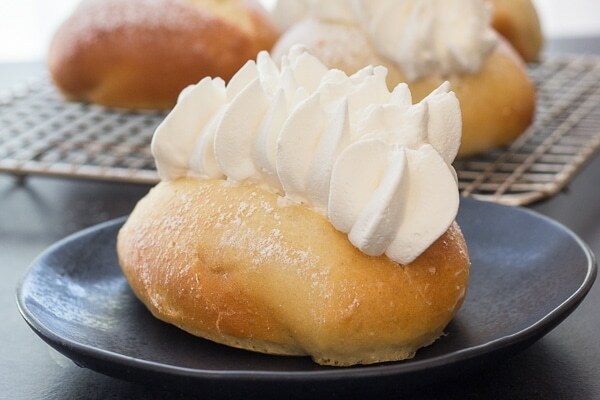 I have been known to serve this dessert with a lightly sweetened whipped cream topping but this time I decided a scoop of ice cream would be perfect. 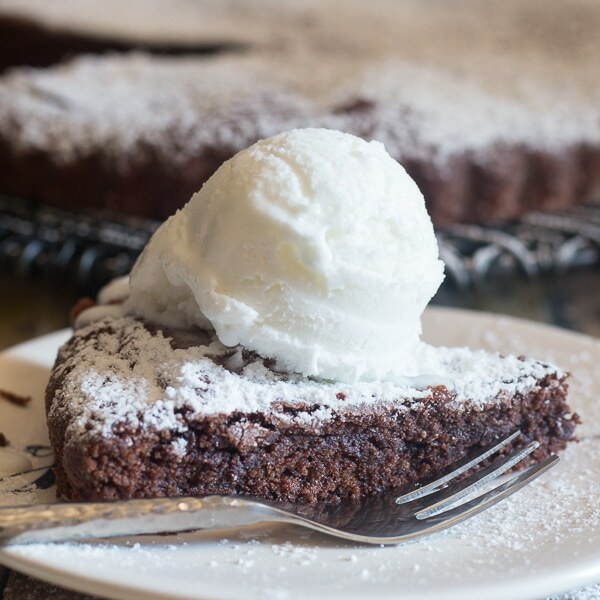 What is an Italian Brownie Cake? 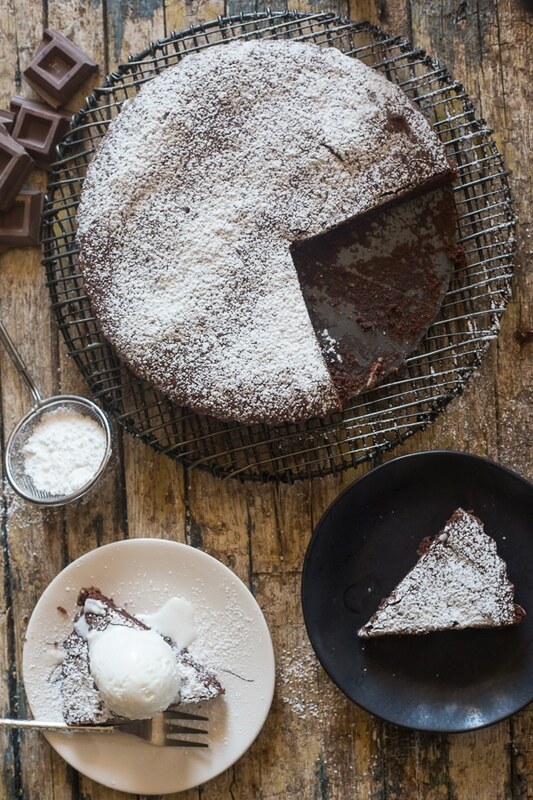 La Torta Tenerina is a low-rise cake that is very moist in the middle, it is made without baking powder, with very little flour and lots of dark melted chocolate. Stiff egg whites which are folded into the batter to give it a slightly crunchy topping. This is the type of cake that you can never get enough. It’s the perfect cake for a fancy dessert, or even a simple get together or why not have a slice with your morning or afternoon coffee or tea? (I won’t tell)! 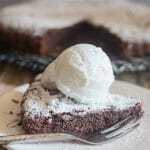 This delicious Brownie Cake originates from the town of Ferrara in the region of Emilia-Romagna (in Northern of Italy). Apparently this cake was made for King of Italy, Vittorio Emanuele III’s bride Elena Petrovich of Montenegro, she was known as the Queen with the tender heart. 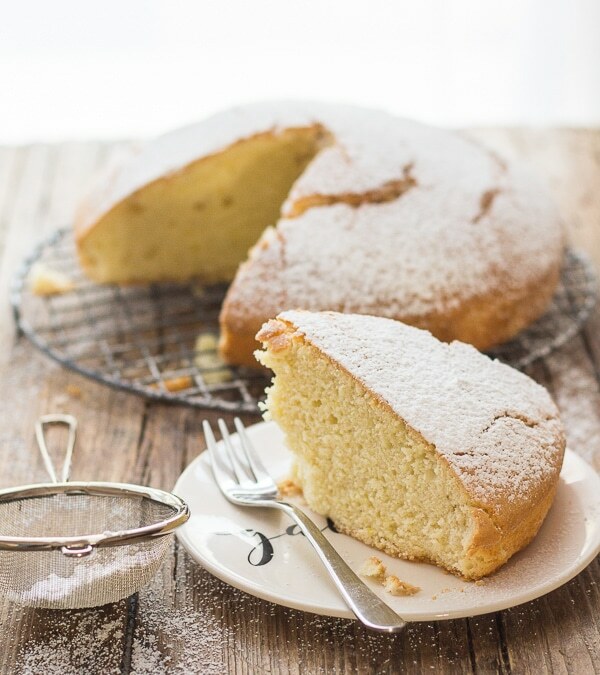 And in her honour the tender cake “Tenerina” which was originally called Torta Montenegrina or Torta Regina of Montenegro was created. So to all the tender hearts I give you La Torta Tererina / Brownie Cake and I hope you enjoy it as much as we do. And I hope you enjoy my Cook Book Authentic Italian Desserts too! Tenerina or an Italian Brownie Cake, deliciously rich & chocolaty , perfect with a dusting of powdered sugar or with a scoop of ice cream. Pre-heat oven to 350F (180C). Grease and flour an 8 inch (20cm) springform pan or pie plate. Melt the chocolate and the butter either in the microwave or bain-marie**, Let cool. In a medium bowl beat the egg whites until stiff peaks appear. Set aside. In a large bowl beat sugar and egg yolks until light and fluffy, approximately 5 minutes. Add the cooled chocolate mixture and combine on low speed. Add the flour, salt and vanilla, beat to combine. Gently fold in the egg whites and combine well. Pour the batter into the prepared pan and bake for approximately 25-30 minutes. The cake is done when a crust is formed on top and it starts to crack ( you an also insert a toothpick into the centre and when it comes out clean it is done - do not over bake). Let the cake cool completely, then dust with some powdered / icing sugar before serving. **Place some water in a small pot over medium low heat, place a heatproof bowl on top and add the butter and chocolate heat (stirring occasionally until melted). I came accross your blog the other day and loving it! 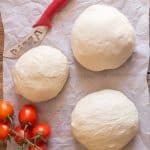 I want to try your recipes (especially this one!) but I wonder what type of “cup” you use for measurement in your recipes? Is any cup ok as long as we keep ingredients proportional? Hi Elif, it’s actually an American way of measuring, so any cup wouldn’t work, but if you use metric, then below the ingredients, click on metric and it will give you the ingredients in grams. Hope that helps. This cake looks delicious! 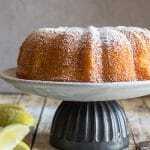 I am having company tomorrow and wondered if I can make the cake the day before? I want to make sure it is moist! Hi Debbie, yes it should be fine to make the day before, just keep it covered. Hope you enjoy it. I have made several of your recipes with much success due to your very clear instructions. I would like to make the Italian Brownie Cake and wanted to know when you say dark chocolate do you mean sweet, srmiseeet or bitter. Thanks for you help. Hi Barbara, thanks so much, I would use semi sweet, in Italy chocolate is measured by the cocoa content and the chocolate I use is 50% cocoa. Hope that helps. Have a great weekend. this is the best ever!! 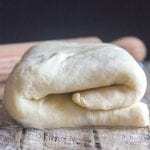 very simple to make and bakes fast…my pre-teen daughter and I made it this afternoon. She liked beating the egg whites and I love the crisp texture they give the top of the cake. melt in your mouth center…I will absolutely make this again! 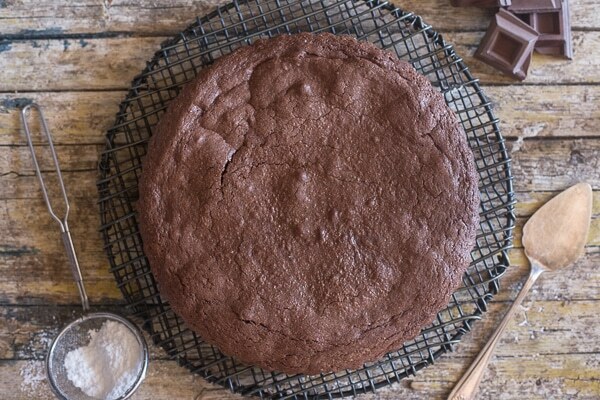 Yummmm this looks so moist and chocolatey, the perfect cake! Also, I love your pictures, they came out so beautiful! Hi Caroly, thanks so much. And yes it is very moist and chocolatey. Have a great weekend. This looks incredibly good! Thank you for sharing this recipe with us! Hi Crystal, thanks so much and I hope you enjoy it. Have a great weekend. A huge hit!!! at the last minute, I decided to frost them. Everyone raved about the taste. Thx for sharing the recipe. Hi Emma, thanks so much, so glad you enjoyed. I bet it’s delicious with frosting. Will your book have metric weights?